The movement towards open access has continued to gain momentum in the social sciences, and in anthropology, with important new journals such as Hau; and new movements to develop alternative publishing collectives afoot. I have just stepped down as editor of the Journal of Material Culture where we are moving a little slower. We have committed to ensuring that there is at least one open access article per issue, and Sage has a very generous Green archiving policy which allows the accepted version of an article to be made available immediately. However, Sage owns both the title and the back issues of the journal which makes a transition to fully open access more of a decision to form a completely new title. Still – we are continuing to work towards that goal. Anthropology & Photography is a new open-access publication series edited by the RAIPhotography Committee. Emerging from the international conference of the same name organized by the RAI at the British Museum in 2014, the series will highlight and make available to the widest possible audience the best new work in the field. Currently online only we aim to set up a print on demand service for those who prefer their images glossy and on paper. 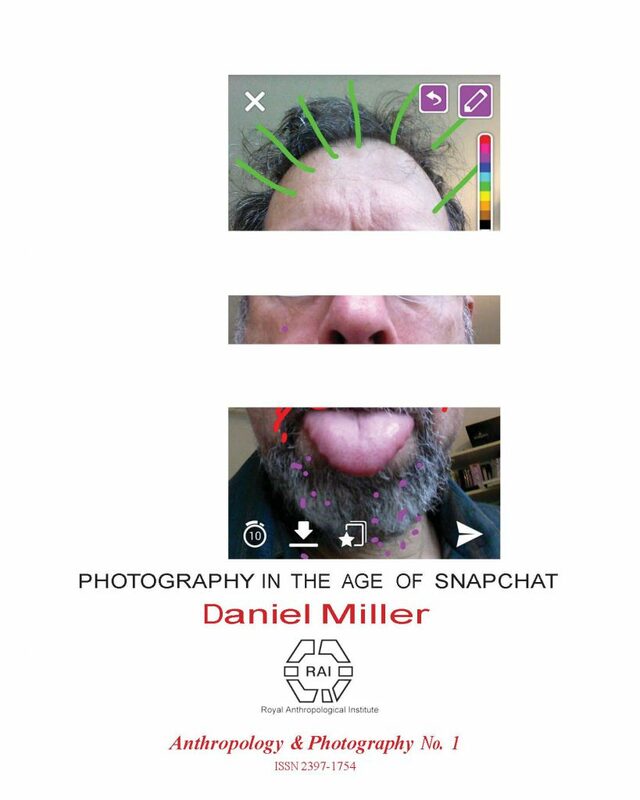 Volume 1 is an essay by Daniel Miller entitled Photography in the Age of Snapchat. Abstract: With well over two billion photographs posted daily on social media this is now the dominant form of contemporary photography. It also means the photograph takes its place with text and voice as central to contemporary human communication and as an aspect of sociality. All of this should be welcomed by anthropologists, since as the photograph moves to the centre stage of everyday life, it also provides new possibilities for anthropological study. But first we need to acknowledge what is happening. A MOOC – Why We Post: The Anthropology of Social Media which launches on February 29 (sign up now!). The MOOC has been translated into all the languages of the research project including Tamil, Chinese, Portugese, Turkish, and Italian, and is an impressive gift back to the communities that participated in the research as well as extending the opportunity to participate in anthropological conversations to new global audiences. AND Several completely open access monographs published by UCL Press, which is the UK’s first fully open access university press. The first three books will be launched in February. Congratulations on the launch of this new OA monograph series.